Local bubble-tea-and-cafe owner I-Miun Liu takes over what he calls “an iconic space for Chinatown” — and takes the opportunity to show his love for the community. Another beloved Seattle dive doomed by development — the Dynasty Room’s story is bitterly familiar. The bar at the Four Seas Restaurant was well-worn, but the details, for those who cared to notice, were splendid: an ornate wood carving of horses and kings; flourishes of brackets tucked into corners; the cushy deep-red Naugahyde around the edge of the bar top. 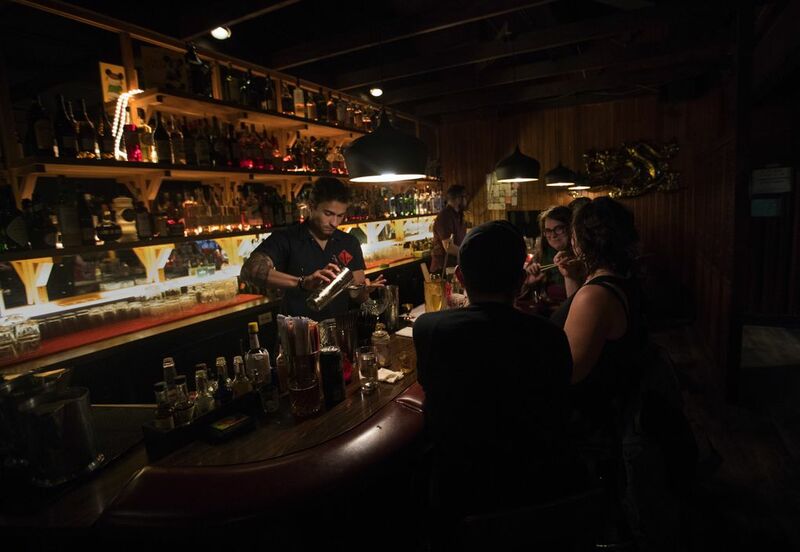 People of different ages and races, from the neighborhood and beyond, gathered here because it felt old-school, dusty-welcoming and dim, with stiff drinks for cheap. At karaoke, they sang their hearts out, even if there wasn’t always a big crowd to hear. Now the building is destined for the wrecking ball. R.I.P., Dynasty Room: Add it to the growing list of lifelong favorites we’ve lost, making way, eventually, for another shiny new building with all the character of an Amazon Pickup locker — right? In this case, thankfully, the plan is for the existing building to be replaced by an affordable housing project with ground-floor small-business retail, to be called Uncle Bob’s Place in tribute to civic hero Bob Santos. The family owners of Four Seas — only the second set since it opened in 1962 — are partnering in the redevelopment with nonprofit InterIm Community Development Association. And for the Dynasty Room, there is a reprieve. Enter I-Miun Liu — he opened his first Oasis bubble tea spot nearby in 2001 and now runs four of them, plus Eastern Cafe. He got a call from someone at the Seattle Chinatown International District Preservation and Development Authority, which he says was less than thrilled at the prospect of the building standing empty before being torn down, gathering graffiti and garbage and more for a year. Did he want to come take a look, pretty please, and think about doing something, anything, with it in the interim? That’s how he found himself touring the cavernous Four Seas space by the light of his iPhone flashlight, getting glimpses of everything left behind like a sort of restaurant rapture. The floors, in places, felt squishy underfoot; the ceiling, in places, was leaking. In the Dynasty Room, the bar listed alarmingly to one side. Liu signed up to take it on — to run it until it’s done. Born in Korea, he’s Chinese; his family came here when he was 4. He grew up in the restaurants they ran in Edmonds, but, he says, “I’ve been down in this neighborhood a lot.” He remembers eating dim sum at Four Seas with his folks as a kid, and later taking the bus by himself to come study martial arts nearby. Undaunted by the massive undertaking, Liu got started. “I inherited my dad’s ox-like work ethic,” he says with a smile. 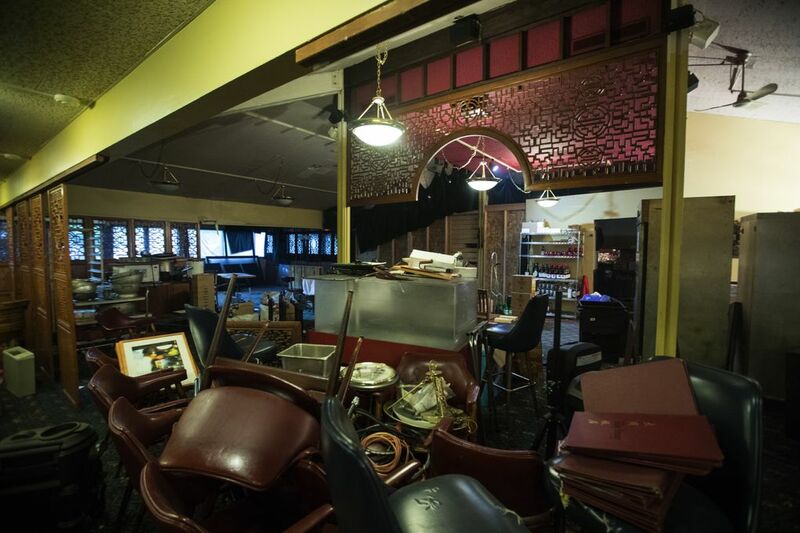 Wisely, he decided to screen off more than half the space, leaving it as-is — behind the curtain is a ghost-restaurant with stacks of plates, racks of glasses, jumbles of chairs, coffee urns, old light fixtures, enormous butcher’s blocks. On the south side of the building, he set about tearing out two layers of decrepit carpet. Just cleaning the kitchen took, he estimates, 200 hours; the subfloor under the bar was rotted out and needed to be replaced. 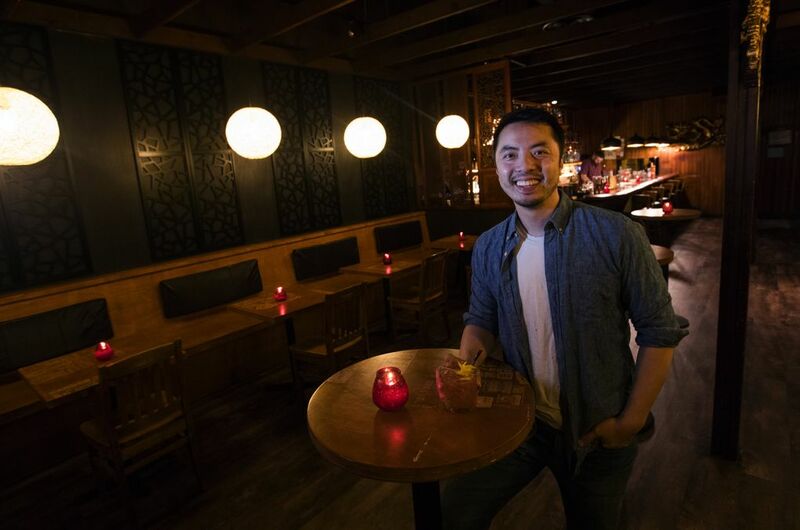 New Dynasty Room bar manager Michael Chu (formerly of Ba Bar) helped, as did others. But Liu often found himself there alone working at three in the morning, the huge room fading away into shadows. He insists he’s not superstitious at all, but, he admits, “There was a level of spookiness to it …” One night, he listened to a podcast in which a little girl laughed. After it was over, he says, “I swear to god, I heard that laugh when it was dead silent.” He’d leave tools in a certain spot, then they’d be gone; he’d check again, and there they’d be. Was he just overtired? Maybe, but the huge rat when he rounded the corner of the basement stairs late one night was very real, and not inclined to move out of his way. “OK, I gotta get the hell out of here!” he said to himself, he laughs now. He had “massive amounts of pest control” come in twice a week until that problem was resolved. Crazily, Liu has two more new places launching right now — Raised Doughnuts in the Central District and the bar East Trading Co. on Capitol Hill. But for him, the Dynasty Room is “the fun, freeing side of it … no business model, no rules.” He hired the firm Electric Coffin for some design elements including the huge cardboard sculpture of a wolf in the entry, and Board & Vellum for help with the layout, and the exterminator. But he took pleasure in doing the vast majority of the work himself — three months’ worth of installing new floors, refurbishing carved screens, charring the interior wood paneling in the parking lot, building tables — as well as in the peculiar liberty of building something destined to be destroyed. “Whether people hate it or love it, we’ve gotta close down,” he says. The update was costly, but Liu says he took no shortcuts. Along with refurbishing the bar, he created a room for events, and there’s no charge to use it — he sees it as a way to give back, a community space. “This neighborhood has given me so much,” he says, from the Development Authority’s help getting permits for his bubble tea places, to a supportive throng “who made Eastern Cafe their go-to coffee shop,” to landlords who gave him a break when making rent was tough. “If I had opened up in South Lake Union,” Liu says, “I would’ve been evicted a long time ago.” The Dynasty Room has already hosted a community barbecue fundraiser for Moksha, after the local shop was broken into and the engaged-to-be-married couple who own it lost everything; a party for Wing Luke Museum across the street is coming up. THE RENOVATION WORKS like magic. At night, the events space glows red, its ceiling showcasing a collection of antique bronze Japanese lanterns. Behind the gigantic wolf in the hallway, a hidden fog machine puffs out added atmosphere. Inside the Dynasty Room, the changes are definite but deft, like a restoration to an allure that seems meant to be. There was “already so much charm and character here,” Liu says. The aim was to “just give it a new flair.” Handsome new wood shelves hold the bottles behind the bar, but the vintage Naugahyde border around it remains; the original carved-wood details stand out, as they should, more than the new wallpaper. A new subtlety for the observant: From one side of the room, the bar’s all warm wood-tones, while looking back the other way, it’s suffused with crimson. When it comes to drinks, Liu wanted “to bring in some ingredients more representative of Asian cultures,” so Chu’s cocktail menu goes the tea-and-tinctures route. 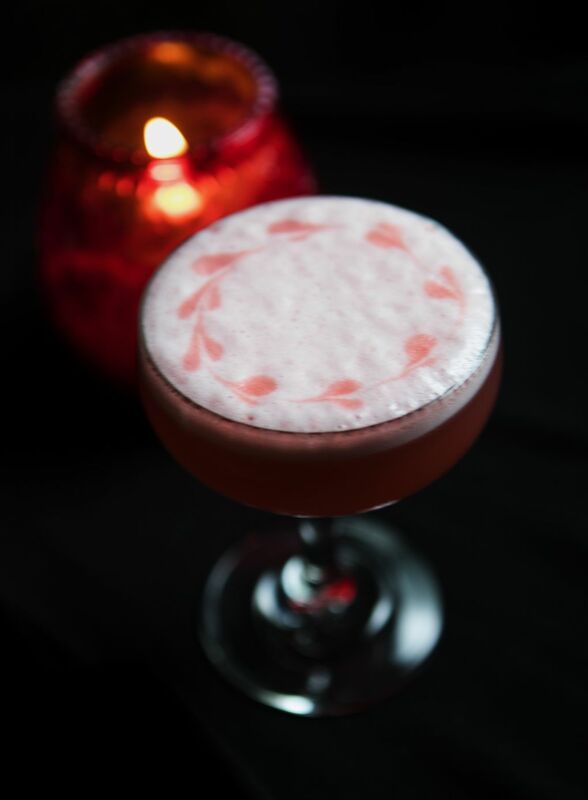 The Watch Me Nay Nay ($11) matches mezcal with lemon, China mist tea syrup, sloe gin and sparkling rosé — it’s herbal but balanced, refreshingly sweet and sour. It’s peachy-pink pretty for pictures, too, as is That’s a Good Boy ($11), with hearts etched in bitters on its fluffy egg-white top. For those who miss the old prices, well drinks are $5 during happy hour, every day from 4 to 7 p.m. If drinks at the Dynasty Room are now ready for Instagram, the food isn’t trying as hard — it’s meant more for snacking. 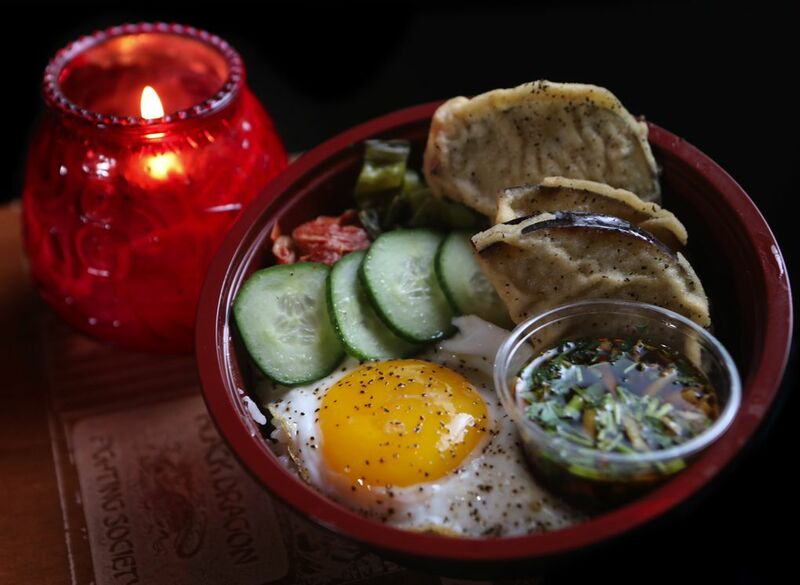 Liu recognizes that the neighborhood already has plenty of great restaurants, so it’s “stuff that I grew up eating,” and prices are low — small plates for $4 to $9, rice bowls for $9.50. 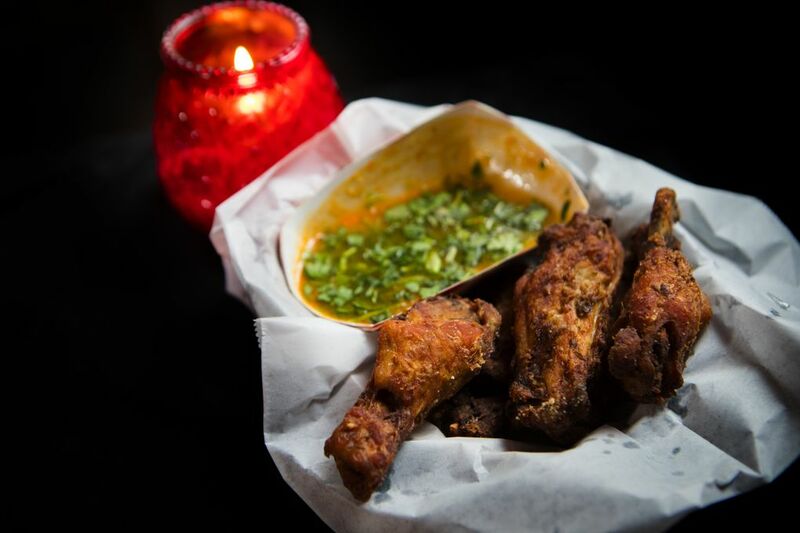 The Taiwan-style Oasis popcorn chicken encases richly marinated thigh-meat nuggets in a super-crispy batter-coating. Glossy, sweet and tangy kalbi short ribs come with a side of sit-up-spicy kimchi. Cold rice noodles with creamy peanut sauce are comfort-food engulfable. The greasy, drunk-food-delicious Spam musubi sandwich — a slab of the salty meat-product plus housemade spicy sauce between two fried rice-pads, seatbelted with a strip of seaweed — could be a late-night lifesaver. 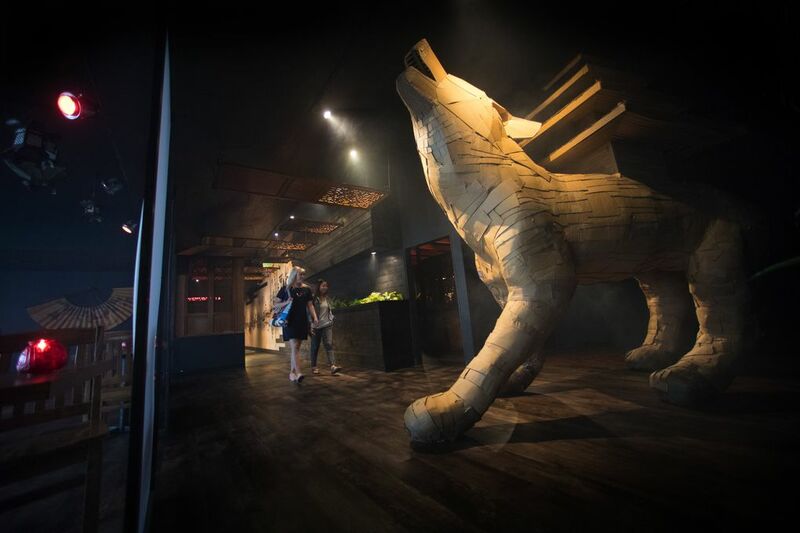 Ask Liu about the Dynasty Room’s new “Wolf Temple” motif, and he’ll talk about how he’s always been interested in the history of Asian immigration to the United States. The wolf, he says, represents America, the West, freedom; the temple represents tranquillity and culture. “Right now, with all the stuff going on,” — he means the current administration’s veritable war on immigration — “it’s so important to realize I’m lucky to be here,” he says. Liu has made the most of the Dynasty Room, which was initially scheduled to fall to the wrecking ball at the end of this year. Now it looks like, with the vagaries of development, it’ll be around a little longer, into 2019. People have asked if he’ll revive it in the new building. “You can’t really bring it back,” he says. “When it’s done, it’s done. This article has been updated to clarify the nature of the Four Seas building redevelopment project.